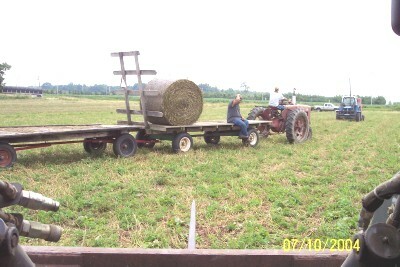 GIANT HAY BALE PICS FROM HIRED HAY BALERS FOR TIM'S CATTLE HAY (THIS HAY WOULD KILL MY HORSES IF THEY EVER ATE ANY OF IT SINCE IT "CURES AND MOLDS" IN THE WRAPPER! 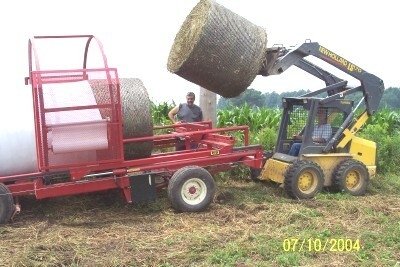 LOADING BIG ROUND BALES ON A MACHINE THAT WRAPS THEM INTO ONE LONG BALE! 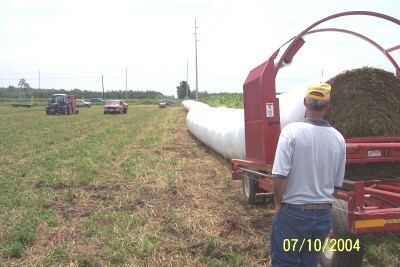 THE GIANT "BALE" ENDED UP OVER 400 FEET LONG! I'M THINKING ABOUT PAINTING BIG EYES AND A BIG POINTED-TOOTHED MOUTH TO CAUSE PEOPLE GOING PAST TO DO A "DOUBLE TAKE" HEE HEE.. IT'S NOT EASY TO DRIVE A SKID LOADER AND TAKE A PICTURE, BUT I MANAGED TO DO IT!! !